What comes after you choose a racquet? That’s right. In this article, I’m going to show you exactly which racquetballs you should choose for your next game. Indoor or outdoor sports, pick the best racquetball balls from the start and play at your best. If you are not sure what color you want to pick, head down to the end of this article for a definitive buying guide. If you already know about racquetball color variations and which ones are suitable for your gameplay, check out these balls right here. 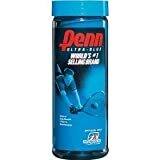 The Penn Ultra-Blue is the most popular and most commonly used racquetballs. These are ? speedballs which provide a decent gameplay with a nice blend of power and skill shots. These are the official balls for the legend tours and the USRA. They are durable and perfect for beginners who don’t want to change their balls after each game. You can play a lot of matches with the Penn Ultra-Blue Racquetballs. You can also use them for outdoor play. But, I don’t think you should. But you can if you want. They have a good bounce on concrete floors. But, the blue color doesn’t give a lot of visibility on tough lighting conditions. Wilson Hope Racquetballs are the best in the business for making pink racquetballs. This color is tough to get by but definitely check them out. It’s very durable, fast and playability is awesome on this. Pink balls are fast. They are perfect for indoor gameplay. These Wilson Pink balls have a good bounce to them. They do provide a good challenge to the traditional and most popular blue racquetballs. A lot of professional women racquetball tournament used them in their matches. 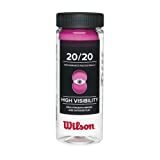 The Wilson 20/20 Racquetball comes from the Wilson Hope line which means with every purchase a small portion goes to the breast cancer research. Pink color provides better visibility indoors than red color balls. They have the similar speed too. Ektelon has been a fan favorite for a long a time. The Premium select has a good consistent bounce. These balls are fast paced and have good visibility. That’s the main reason why The Ektelon Premium Racquetballs became famous among enthusiast class. These blue racquetballs are reliable and great for all sorts of players. They have a comfortable feel to them. These are approved for tournament use by USAR. Speed is on par with the Penn Ultra-Blue Racquetballs. These are more lively than the Pro Penn. Lighter and more bounciness makes them perfect for indoor sports. 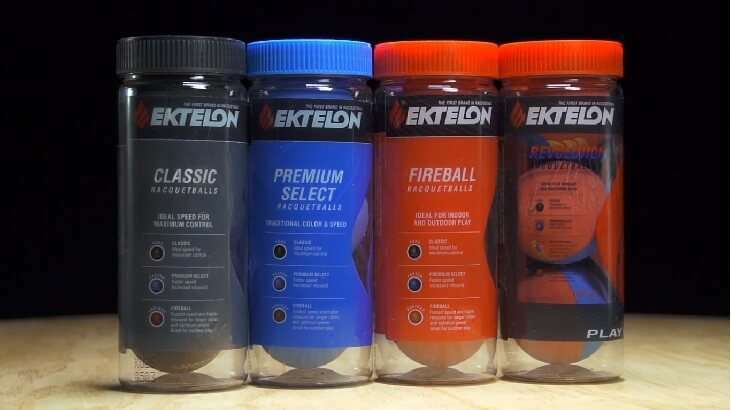 If you don’t want to go with the Penn Ultra-Blue, then go for the Ektelon Premium Racquetballs. Great durability. I highly recommend them for casual players. One of the fastest balls in the market. It’s made specifically for outdoor. Don’t let that fool you though. I mean this is a great outdoor ball. Also, very good for indoor. It’s the fastest ball from Penn. This red racquetball gives a high visibility on the court. They also have a long lasting period. a because these balls are meant for intensive and explosive gameplay. If you like fastballs, the Penn Ballistic 2.0 Racquetball is at the top of the ladder. If you are not a hard hitter but still like to hit that ball hard, this is the one. Make sure you check out these balls. Who knows, you might actually make them your favorite. This is an awesome ball from Propenn. This ball is used by the IRT (International Racquetball Tour). The professional tour of racquetball player uses them. That should give you an idea of how good these balls are. A lot of engineering went into this ball. It’s very soft and it’s going to be very fast as well. Good on the elbow and good on the shoulder. So, if you have shoulder problems or elbow problems, make sure to check this ball out. 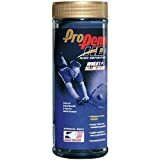 (READ MORE: Step-by-step Guide for choosing the Best Racquetball Glove, Best Racquetball String and How To Choose Racquetball Racquets). Combine recreational gameplay and fast-paced gameplay with the Python RG Multi Colored Racquetballs. It has a combination of red and blue. It has a nice blend of speed and durability. Also, these balls were endorsed by the OG, the racquetball legend Ruben Gonzalez. These dual color balls are designed for both indoor and outdoor gameplay. The combination of these two color gives you great visibility. These multicolor balls from Python are also durable. By durable I mean, you can enjoy a consistent match longer than blue or red color balls. If you want high visibility in and out of the court, make sure to check them out. These Propenn Green Racquetballs are fast. More durable than purple balls. They are great for fast-paced rallies. These green balls are used in a lot of national events. They are also played on the pro tour. Its playability is probably at the highest peak. The Propenn Green is certainly faster but not as much as red balls. It’s slightly heavy but adds up to its durability. The bright green color gives you a good on-court visibility. Since professional players use these balls, there isn’t much to talk about. If you want to play like the pro’s and take your game up a notch, definitely check these out. The fastest balls in the Ektelon’s racquetball line up. These red balls are ideal for indoor and outdoor play. They have a high visibility. Playability is also good in both areas. If you are used to the fast game, get ready be surprised. The Fireball will make your game even faster. Power game players will definitely love these balls. They don’t have that softness to them. Watch out when the ball comes in too fast. Durability is ok. I mean, let’s face it. Racquetballs aren’t meant to last long. However, these balls do hold up pretty well. 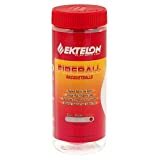 The Ektelon Fireball will surely lit a fire into your game. These black balls from Gearbox are very durable. They have a consistent bounce to them. Black balls are bright and sharp. It comes with a 3 ball can. These are some lively balls. If you have shoulder or elbow problem and want to enjoy a decent medium paced game, these sleek black balls are perfect. These are slow balls. You can easily predict where the balls will bounce off and make that is shot to confuse your opponents. Black balls have a reputation for being very durable. They maintain a consistent bounce and quick enough to get you moving. These are perfect for practicing your swinging technique and ball placements. Ektelon has a good reputation for making dual tone racquetballs. There is a perk of having multiple color balls. You can see the spin more clearly. The ball itself is pretty fast. Almost similar to blue color racquetballs. The red and blue combo makes it perfect for indoor and outdoor use. Dual color racquetballs are ideal for both indoor and outdoor lighting conditions. If you want a fast-paced game while maintaining high visibility, the Red/Blue Revolution balls are the go-to balls for you. You can get them in 3 balls can case and 24 can case which holds 72 racquetballs. ProKennex also makes dual color balls but they are hard to get by. 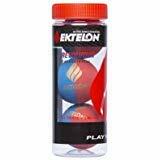 However, in terms of durability, the Ektelon Red/Blue Revolution Racquetballs will last much longer. I know a lot of us associate racquetball with blue racquetballs. That’s not necessarily the case. There is a wide variety of balls to choose from. Different colors, different speeds, and different weight. Different balls that might fit your game style. If you are new to racquetball, you might not know the difference between these balls. Stick around, as I go through each of the aspects of choosing the best racquetball balls. We are all familiar with the blue racquetballs. But, did you know that there more color options to choose from? Black racquetballs, purple, pink, red and also dual tone colors. These are not for aesthetics only. There is a lot going on behind the scene. These colors indicate how fast the ball will travel, bounciness and visibility. Some are made specifically for indoor where there are a lot of artificial lights. And, some are made for outdoors where you can see the ball clearly on a sunny day. Tip: A good idea for a beginner is to buy Bulk racquetballs. Which is sold in a jar with different color options available. One might get confused because different tournament organizations use particular colors for their tournament. It’s just a marketing policy. They do deals with the manufacturers to exclusively use their brand and a specific color of balls in their tournament. There are no specific official balls. They change from time to time. Two of the most popular black racquetballs are The Ektelon Classic and The Gearbox racquetballs. Both are renowned brands. Black balls start as slower balls. But they do have high durability. They are also very consistent and can take a beating. These make good for longer rallies. Older players are fond of them because they can enjoy a medium paced game with these balls. Not just old people, even younger players use them for a smart gameplay rather than just raw power and kill shots. The obvious ones. Best racquetballs for recreational use. They are commonly associated with the racquetball sport. These blue balls have a consistent bounce to them and perfect for beginners and amateurs. Medium paced balls for smooth gameplay and practice sessions. They do hold up pretty well. The green balls are considered as a faster alternative over the blue racquetballs. These balls are faster, will bounce off the wall livelier and result in a much shorter rally. Truly intended for power players. If you prefer power game, go for the green racquetballs. They have the same speed as the blue balls but with greater durability. And, they are also better than most other outdoor and professional balls. I have seen a lot of tournament that played with these green balls. Fastest racquetballs for indoor use. Most lively and makes the game much more exciting. These purple balls are also the official ball for the International Racquetball Tour. Since it’s the IRT’s official balls, they do make a great purchasing option for all types of players. Mostly designed for the professionals. But, you can go ahead and give them a shot if you like. Almost all the professional tournaments use these balls. It keeps you alert at all-time. The only drawback would be its durability. Which isn’t a problem for tournament matches because they use a new ball for every match. Fastest racquetballs for outdoor play. Because these balls are made for outdoor matches, they have a very high visibility. Even in tough lighting conditions, you can see these balls clearly. These are also for outdoor use. But they are also played in indoor matches as well. A lot of people don’t prefer pink balls for the outdoor play. But, these do provide excellent visibility. One of the most popular pink colored balls are the Penn Pro Pink racquetballs. They are also the official balls for the ladies Professional Racquetball Tours. Best for visibility outdoor and indoor. They provide action packed, fast paced gameplay for a truly power-packed match. It doesn’t matter which color court you are playing on, they’ll maintain their visibility. All the balls measure 2.25 inch. That is required by the United States Racquetball Association. Every tournament balls are of the same size. So, you don’t need to worry about this one. About the material, all of the manufacturers use soft rubber. These two factors are common for all racquetballs. Apart from size and material, the primary difference lies in weight and color. Those are the key features you should consider. Racquetballs come in a can or a jar. Before purchasing, you should consider how many balls are there in the container. They come in 2 ball cans, 3 ball cans and also 12 ball jugs. It’s easy to see that getting the 12 ball jug is the most cost-efficient. However, there is a slight drawback to it. During production, all the balls are pressurized inside. To keep the balls in equilibrium inside the jar, the jar itself is pressure sealed. That way manufacturers can maintain the bounciness of the balls. Buying bulk racquetballs always seem to be a good deal since the cost per ball is significantly lower than 2 balls or 3 balls cans. But, once you open up the container, those balls start to lose their bounciness. Even if you don’t use them. Once, you open the seal, they’ll slowly lose pressure. And, when you start playing with these balls, the process is accelerated. They’ll lose their initial bounciness much faster. Normally, pro players change their balls every 2-3 games. If you are new to this sport, you won’t know the difference between new and old balls. Tip: For a new player, go for 12 balls jug. It’s cost effective and allows you to play with different colors of racquetballs. Durability isn’t something that most people worry about. You see, in tournaments, they use fresh balls in every match. However, for normal players like us who just want to get into the game or do some practice match, we need to look at this aspect of choosing racquetballs. There is rule of thumb for determining the durability of these balls. As long as the brand logo is visible, the ball should perform just fine. When it fades, it means it’s time to switch to new balls. Stick to this rule of thumb and use different balls to determine which color version lasts long. If you are new to this sport, it’s understandable that you don’t want to keep buying racquetballs for each game. Also, you won’t notice that much of a difference between old and new ones. Just keep playing until the ball breaks or the brand logo completely fades away. Tip: Stick with the manufacturer logo rule of thumb. Always go for the name brands. Some of the popular brands are Wilson, Penn, Ektelon, Python & Gearbox. There are also other brands out there. But these are my top favorites. Most of the balls they make are labeled “USAR approved”. They make tournament grade racquetballs which you can buy with ease. That’s the main reason why I have included them in my list. And, also the fact that most of the balls featured here are used in tournaments. For more tournaments grade gloves, check out these best racquetball gloves for 2018. Hope you found what you came to look for. If not or you want to add a bit of knowledge from your personal experience, leave a comment below I’ll make sure to add them here. I tried my best to make a list that features different options available for choosing the best racquetballs there are. Also, included a buying guide if you don’t know a single thing about the color variations.